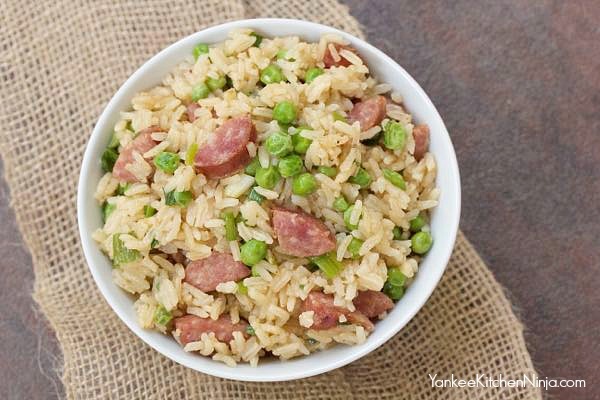 Seriously, you can have this one pot kielbasa and rice with peas on the table in less than 30 minutes. The prep is very minimal (just a little chopping and slicing) and you'll even have time to do a little multitasking once the pan is covered and simmering away. This recipe comes straight from the new cookbook of one of my blogging buddies, Mary from Barefeet in the Kitchen. Her cookbook is called The Weeknight Dinner Cookbook -- and, trust me, it's aptly named. Full of simple recipes that even the pickiest eater will love, this cookbook is going to be the perfect gift this holiday season for anyone on your list who is new to cooking or just simply busy as all heck. 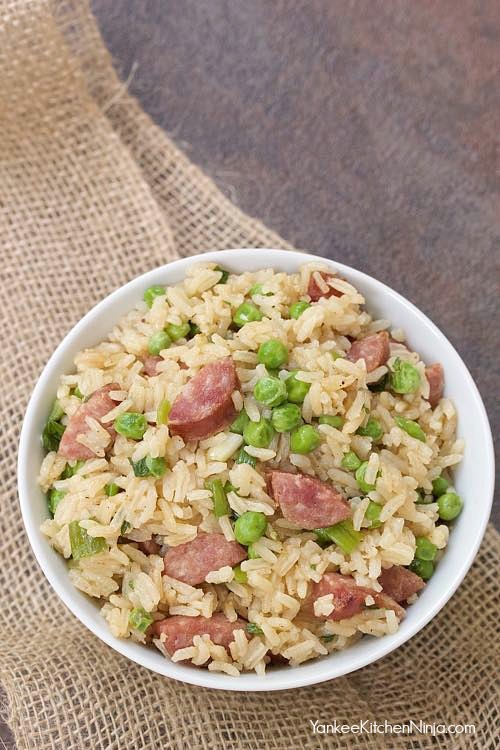 Per Mary's suggestion, I've used smoked kielbasa in this one-pot dish, but I also think that diced ham or rotisserie chicken would be equally as good -- and equally as fast to prepare. What's your favorite one-pot recipe? Maybe my one-pot tomato basil pasta? Or my healthy turkey pilaf? Leave a comment: The Ninj wants to know. Heat the oil in a large skillet over high heat. Add the garlic and saute one minute, until fragrant. Add the sausage and cook for about another 3 minutes, until it begins to brown. Add the broth, rice, garlic powder, and pepper to the pan, stir and bring to a boil. Reduce the heat to low, cover the pan and simmer for 18-20 minutes, until the rice is tender and the liquid is absorbed. 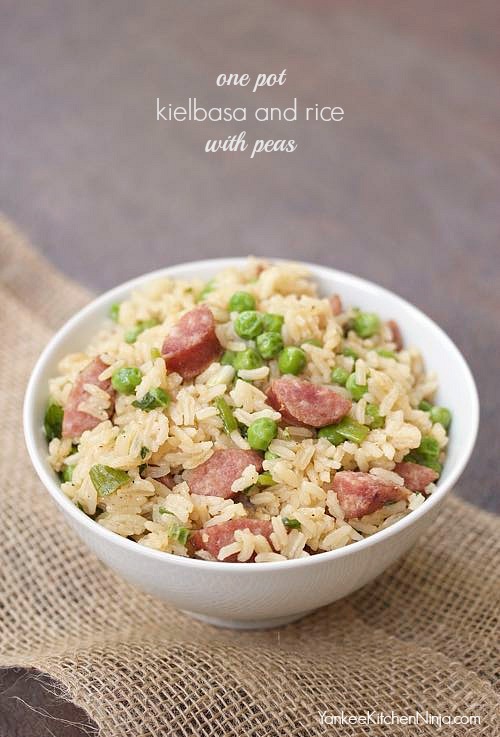 Remove from the heat and stir in the peas, green onion and parsley (the peas will thaw in the rice mixture). Season to taste with salt. My son made this for dinner last week! This recipe is one of my kids' favorites in the book. I am thrilled that you enjoyed it too! Thanks so much for your support, friend. I really appreciate it! There are more than a couple recipes in your book, Mary, that have quickly become requested favorites in our house! Thanks for letting me share this one with my readers.